Sunday, January 31, 2016 we had Installation of Church Officers during worship. Below is a picture of the officers who came forward to be installed. 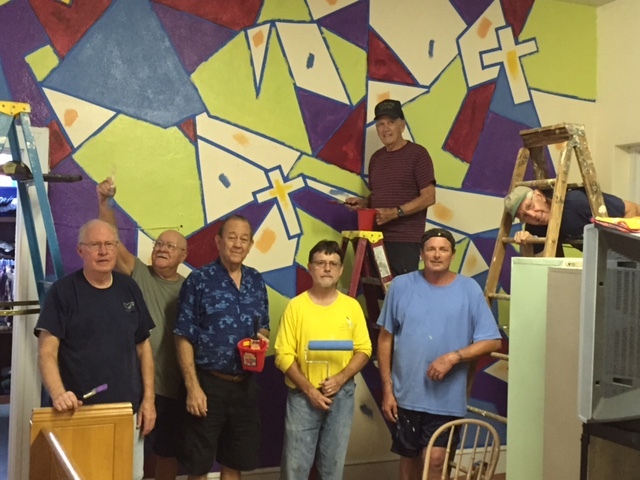 Below you will see some of our volunteer men doing some painting (August 26) as they assist our youth who started the project of redoing rooms that will be used for Youth Activities in the church basement. Those painting on this occasion include: Virgil, Larry, Dave, Steve, Ron N., Ron H., and Sam. Thanks guys! 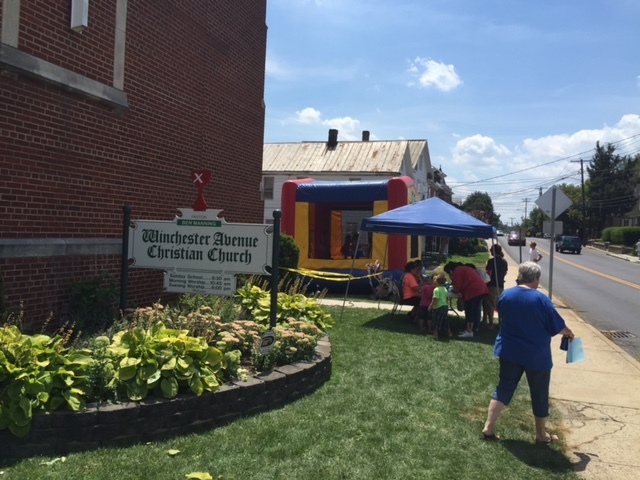 A Block Party took place at WACC on Saturday, July 25th, 2015 starting at Noon. 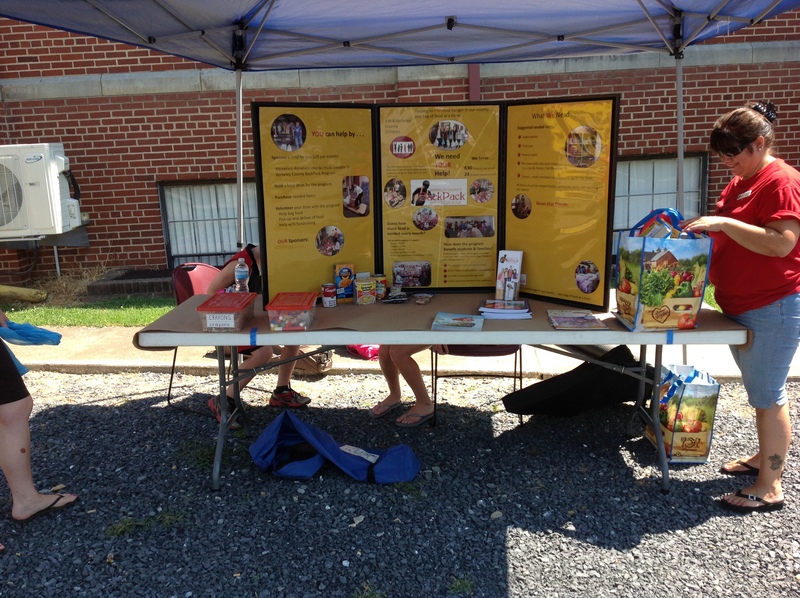 The purpose was to provide fun activities for the children in our surrounding community and for their families. As the idea grew plans were made to provide back to school Backpacks for the children on a first come bases. This was sponsored by our Education/Youth Department under the leadership and planning of Angel Webb. 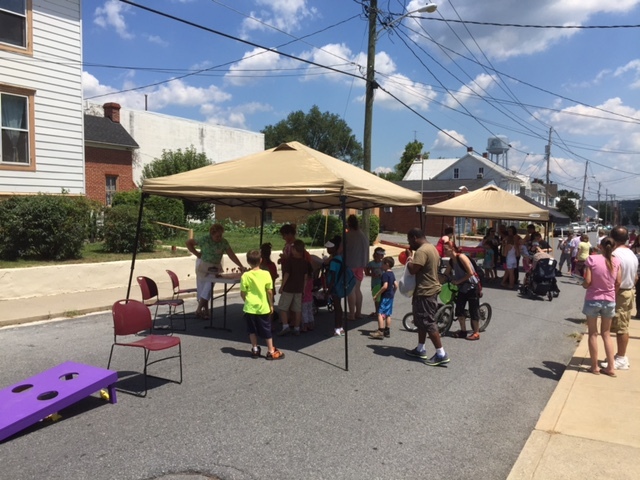 We could not have done this without the help of many of our church members. Angel estimates that we had 300 present (children and their family members). 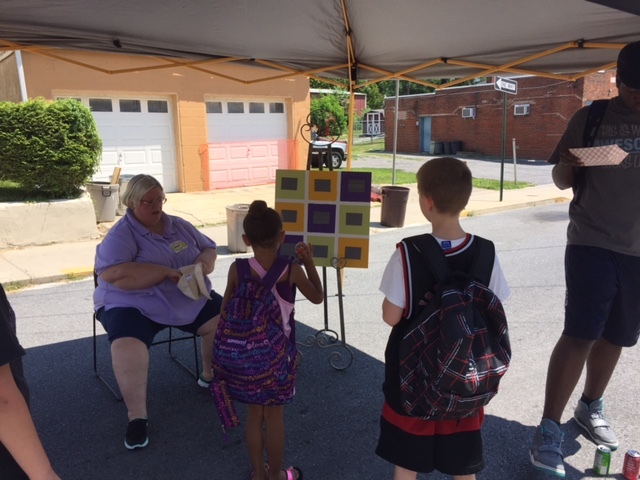 100 backpacks were given out. Sorry we ran out. 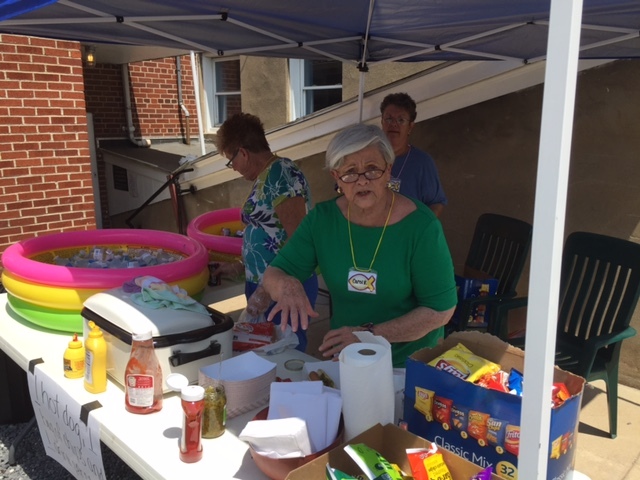 250 free meals were served (hot dogs, drinks and trimmings). We also ran out of dogs. 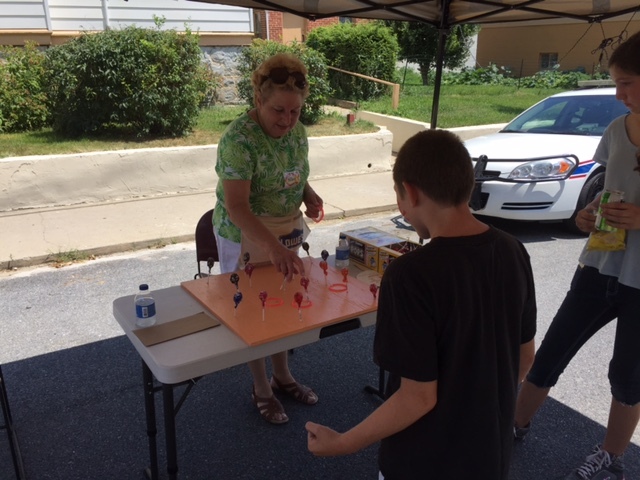 Sam makes sure the registration table is sturdy and ready to go…. 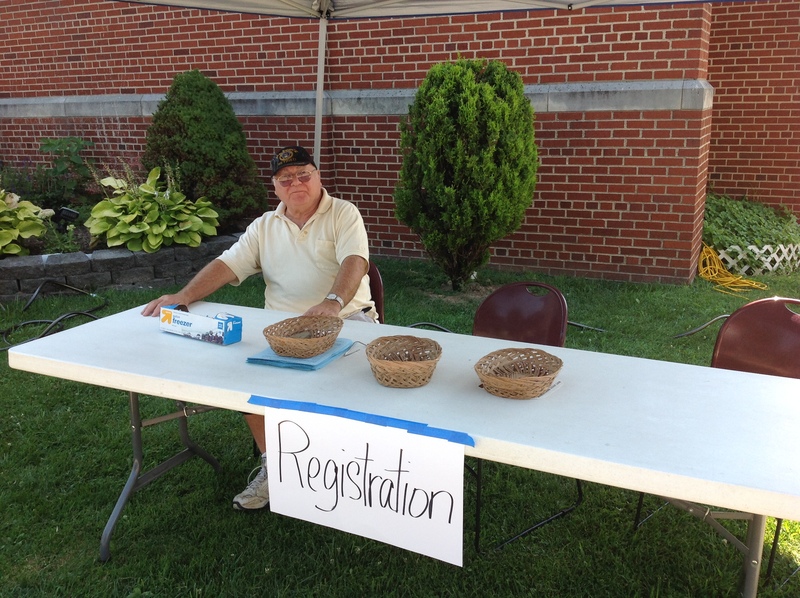 Registration begins for early arrivals…. at one point the line wrapped around the front of the church building. 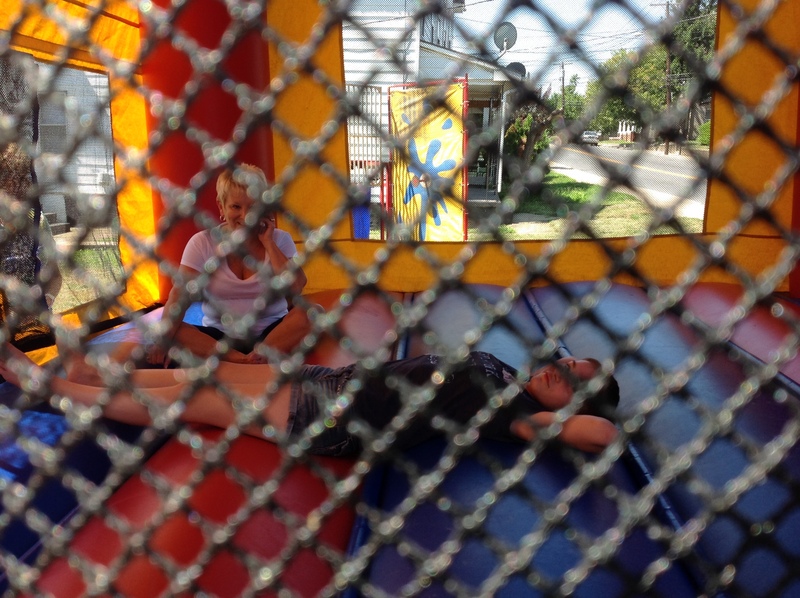 Christi and Remi make sure the Bouncy House has plenty of air. Looks like a good place to take a nap! 100 backpack for back to school were given to children on a first come basis. We are sorry we ran out. We thank all who contributed to this program. 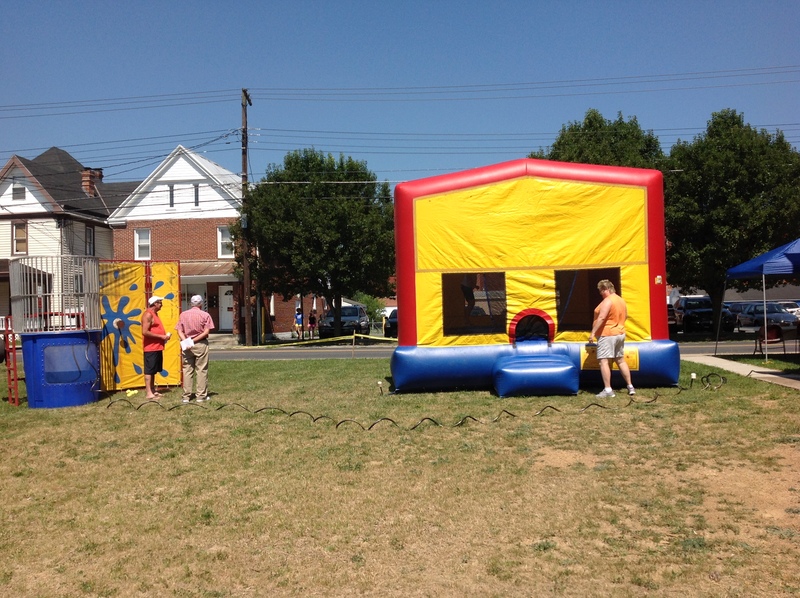 The dunk tank was a big hit (on the left). We understand Ron got dunked a lot. Ron and Gary are seen here filling it with water. Christi seen here at the painting booth. 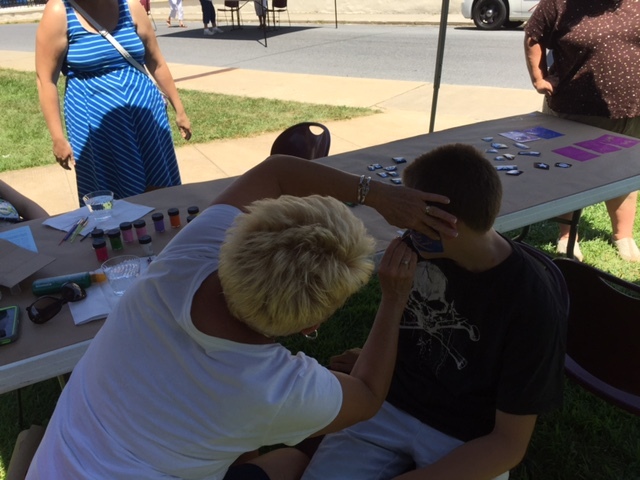 This child is getting a symbol painted on his face. We are sure some of the children will not wash their faces for at least a week! We had some unusual visitors (not Eddie). Notice the Clothes Closet was open for this event and we distributed many items of clothing to members of the community who needed them. (Clothes Closet is normally open on Thursdays). This is just part of the food crew serving free hot dogs and accessories. Derrinda, Carol E. and Carol R. We ran out after 250 servings. The food was excellent. Games galore on Stephen Street. The City permitted us to shut down Stephen Street for this and we also thank the City Police for being present to help with traffic control. 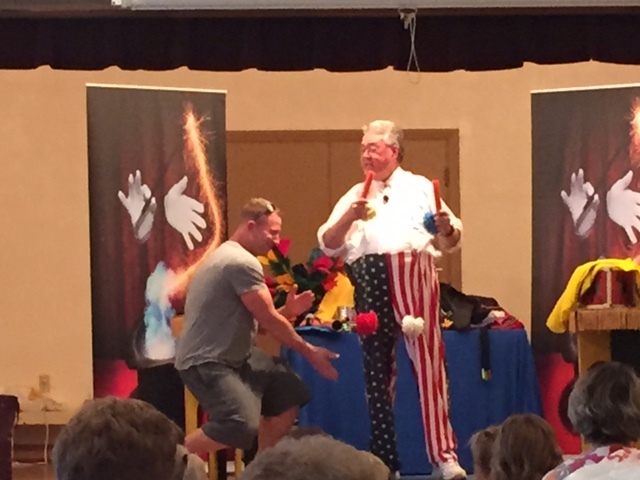 We had a magician give two performances in Fellowship Hall. 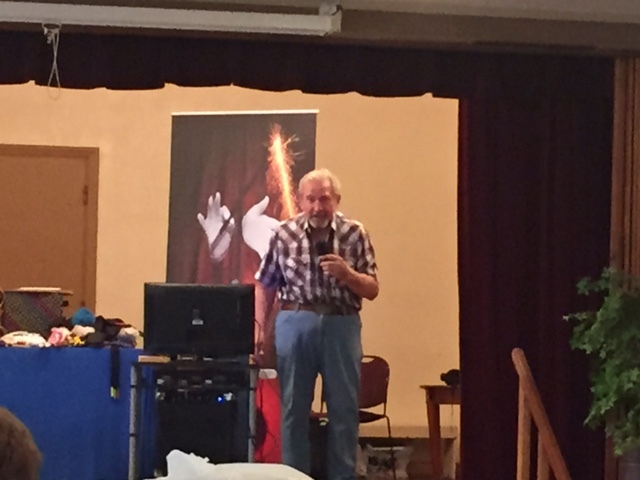 Here Joe was asked to come up from the audience to help with one of the magic tricks. The next three frames show Joan, Wilma and Sam at the games they assisted with. 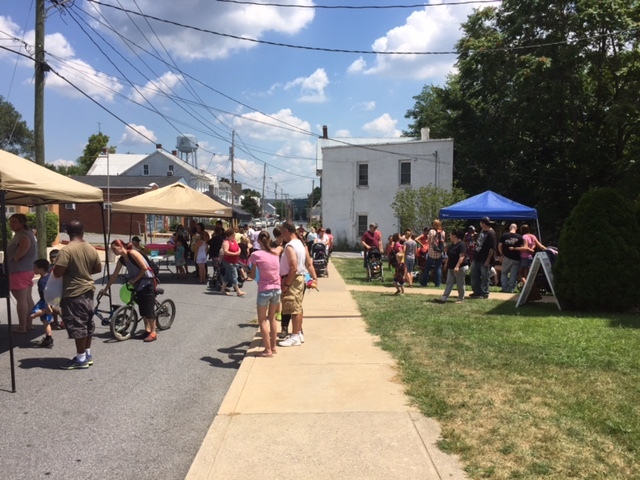 Many, Many thanks for all our members who helped to make the Block Party a wonderful and successful event. A lot of work paid off in good will to our community. 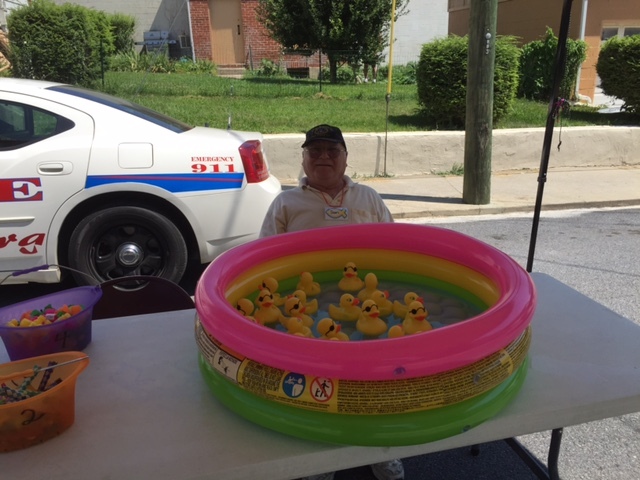 Special thanks to Angel Webb for planning this event and the many from the community that provided gift and prizes for the children. You can see a picture of the Quilt (below) that will be raffled off with proceeds going to the “elevator fund.” Tickets for the drawing are $1.00 for one ticket or $5.00 for seven tickets. Note the “Christmas” motif and the poinsettias. The Quilt was made by Carolyn Manning. See Barbara McClure for details and tickets. 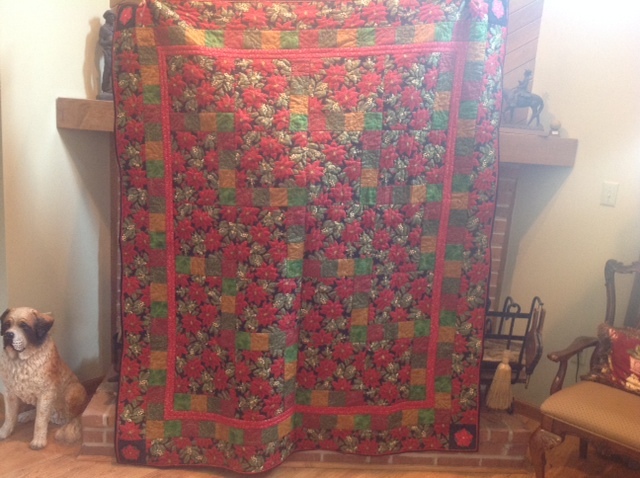 You can see a picture of the Quilt (below) that will be raffled off to help pay for the new refrigerator for the newly remodeled kitchen at church. The goal is raise $1700.00. Tickets for the drawing are $1.00 for one ticket or $5.00 for seven tickets. The Quilt was made by Carolyn Manning. See Kim Dellinger for details. 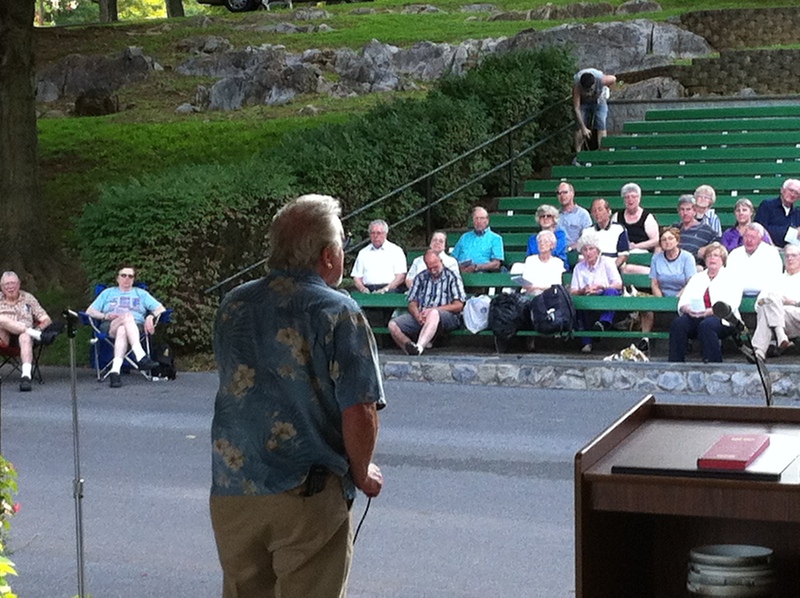 Winchester Avenue Christian Church was host to the larger community for the Sunday Evening Vesper services at War Memorial Park. 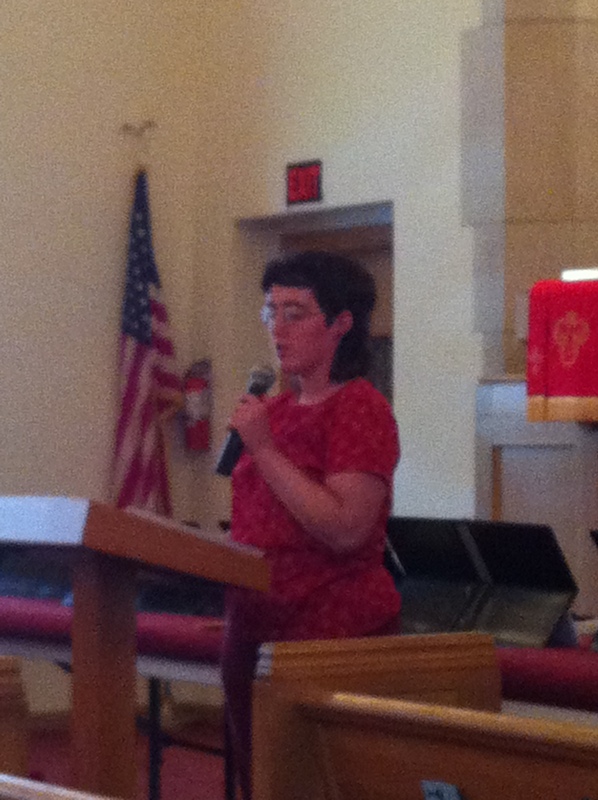 This was on August 11 at 7:00 p.m.
Below are a couple of pictures taken by Pastor Ben. 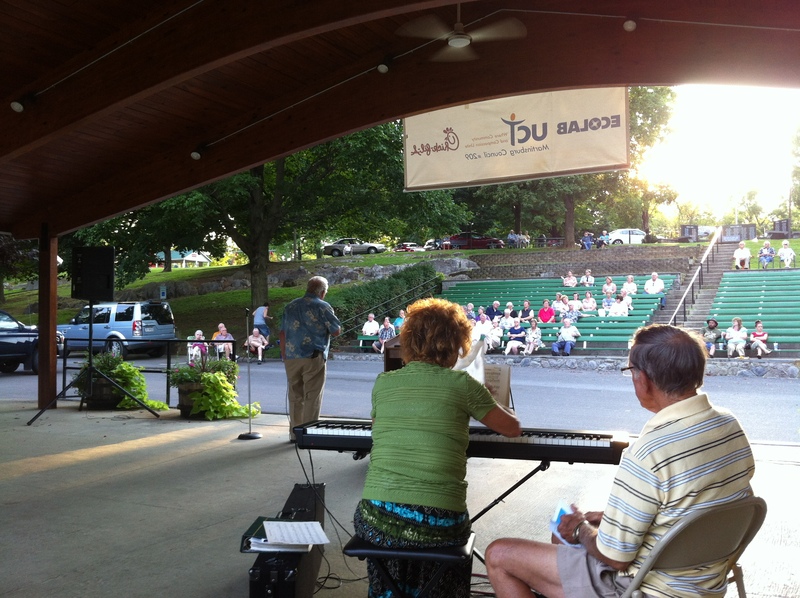 We thank Buddy Trabert for the solos and Dot Simpson for playing the keyboard. We had a nice attendance from our congregation. 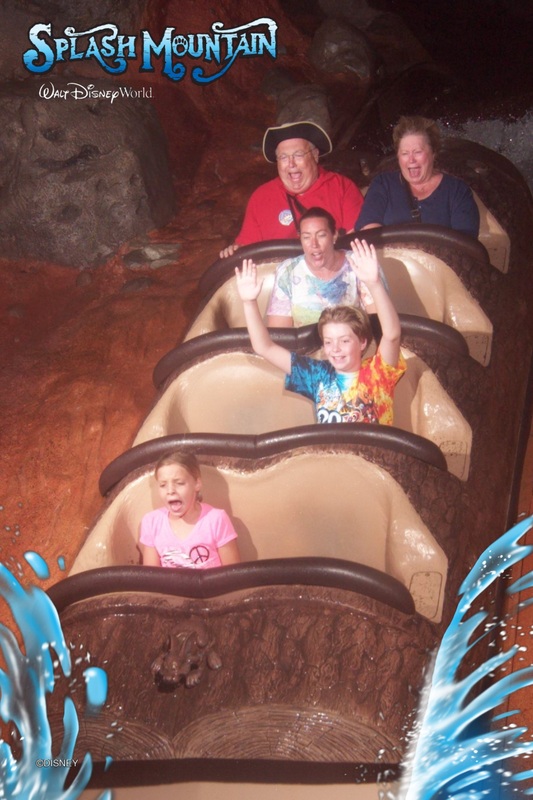 The Mannings wrapped up their last night at Disney World on “Splash Mountain.” With daughter Barbara (from PA) and grandchildren (from NC). See you soon! 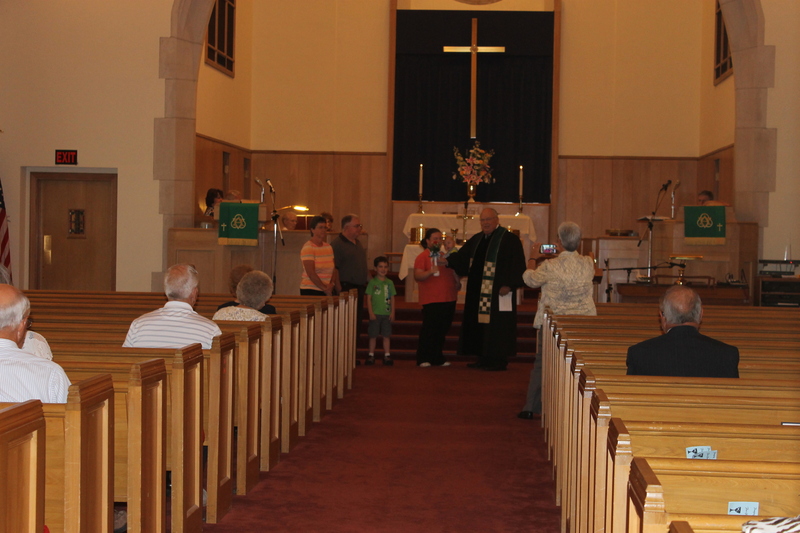 July 7 we had a baby dedication. 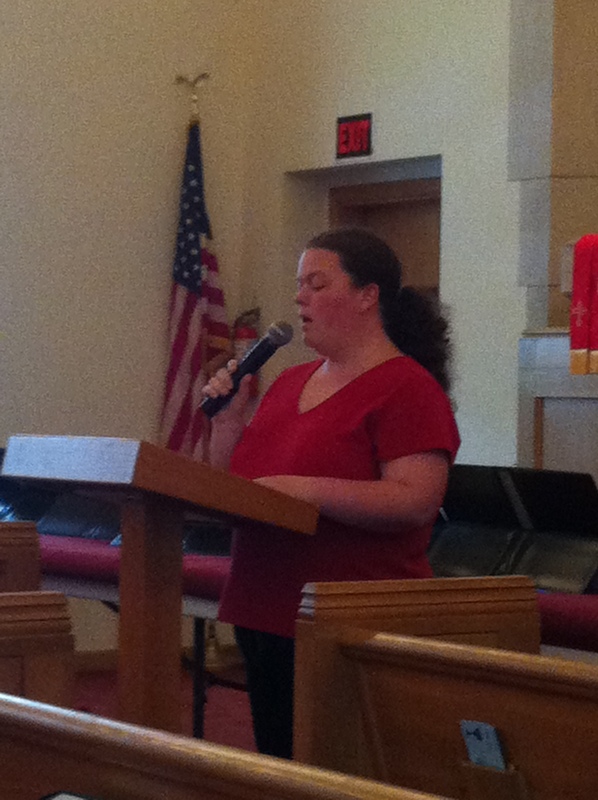 Karson Timothy Writt was dedicated to the Lord. See the picture below. 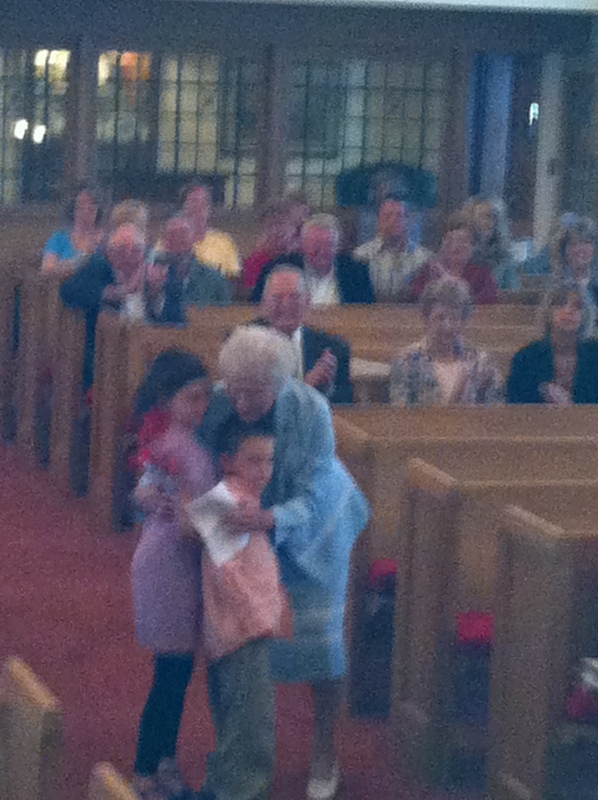 Present was mother Chelsea, brother Kaiden and grandparents. 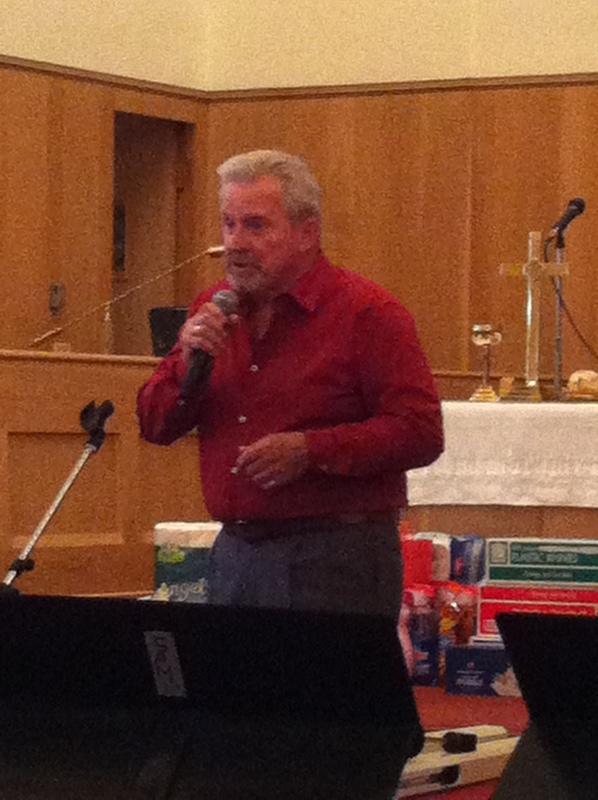 Pastor Ben presided. 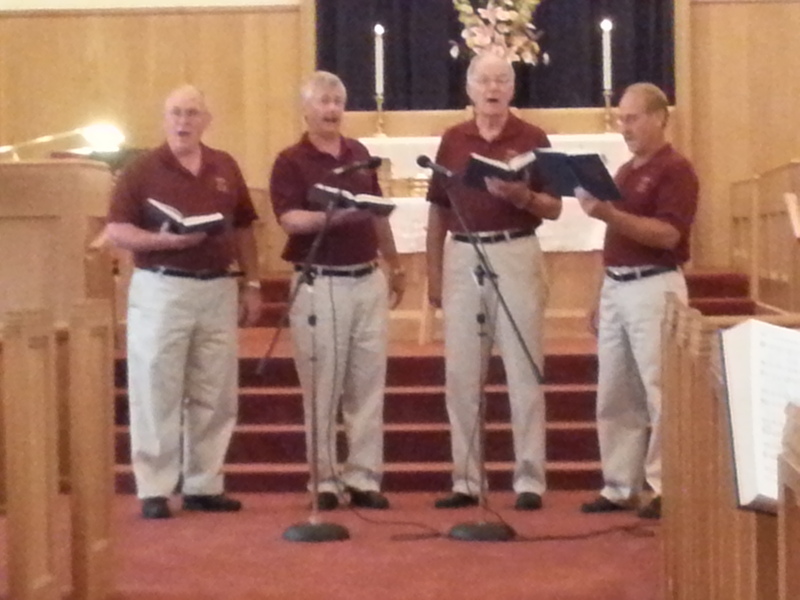 June 30 the King’s Chorders Barbershop Quartet perfumed during our morning worship. 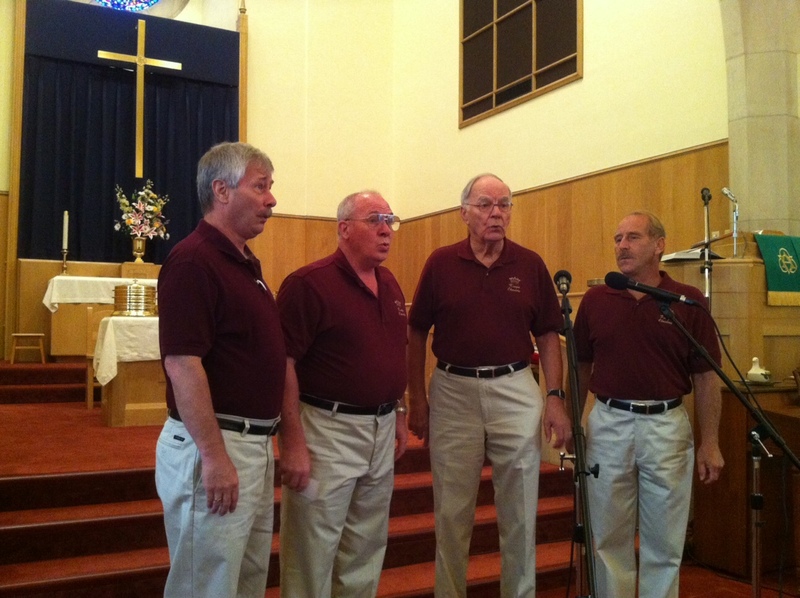 This picture shows them leading the congregation in singing “Amazing Grace.” They did a wonderfully amazing rendition of several favorite barbershop arrangements of gospel music and one patriotic song we got to sing along with them. (Photo by Kelli). 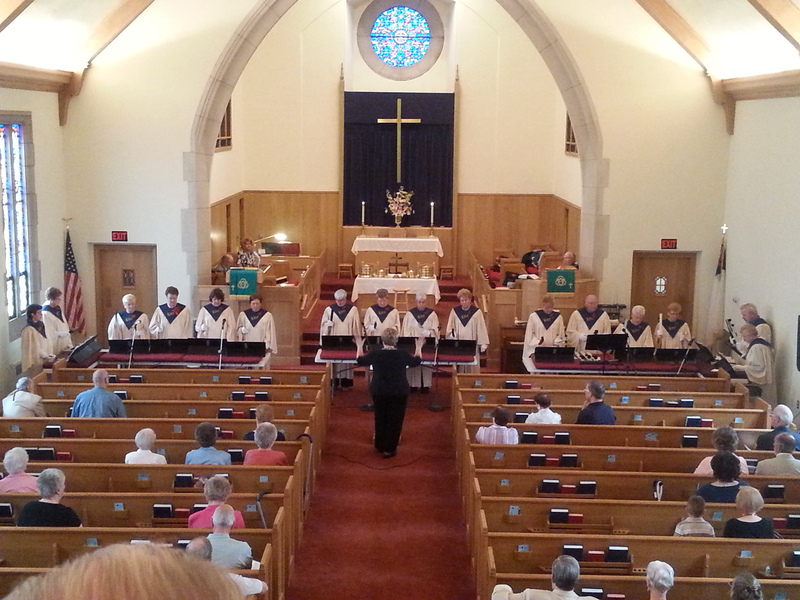 This Photo shows the King’s Chorders doing one of their many numbers during our worship service. They did a truly outstanding job and we thank them for being our guests. 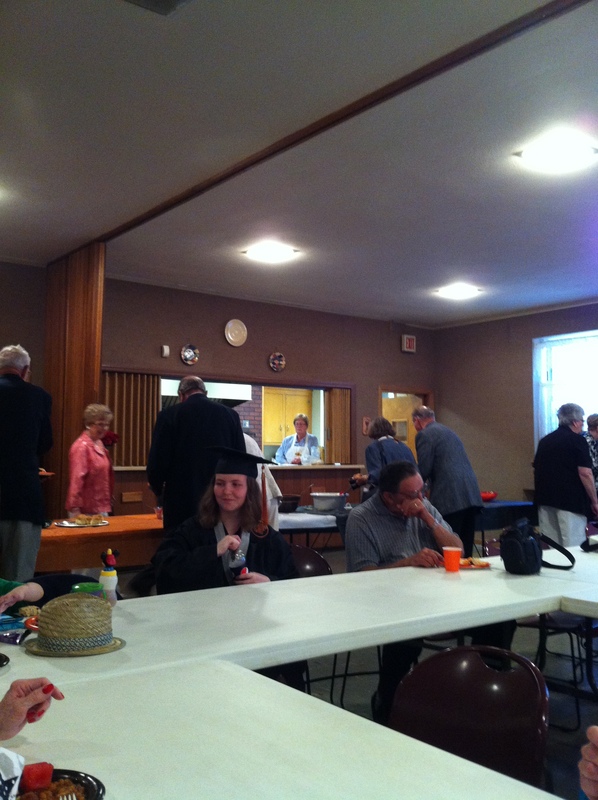 Pastor Ben honored our high school and college graduates. 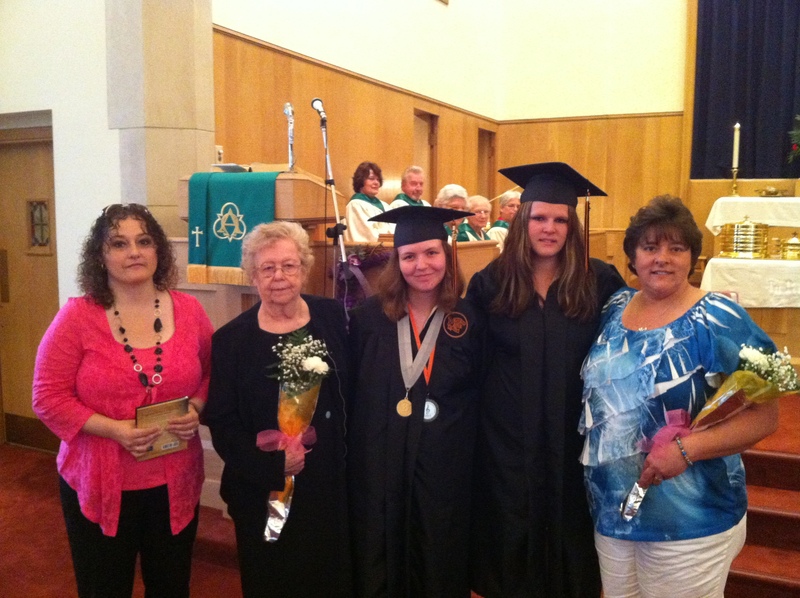 Graduating from college with a degree in Child Development is Angel Webb (left) and Martinsburg High School Graduates Donielle Elliott and Amber Siler. Also pictured: Ginny Hedges and and Lisa Siler who were provided carnations for their support. May 19th was Pentecost Sunday. 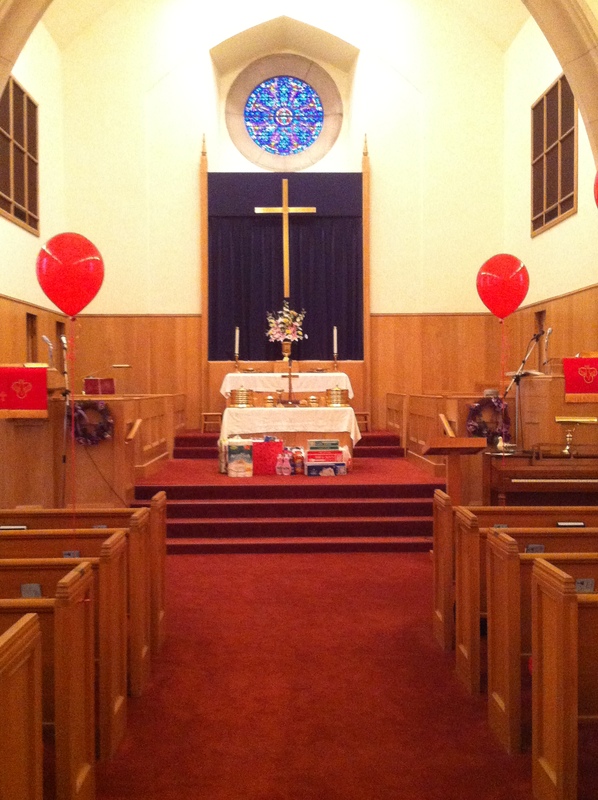 Note the beautiful decorations as we celebrated the Birthday of the Church. In front of the altar we have gifts that were brought for the church’s birthday! 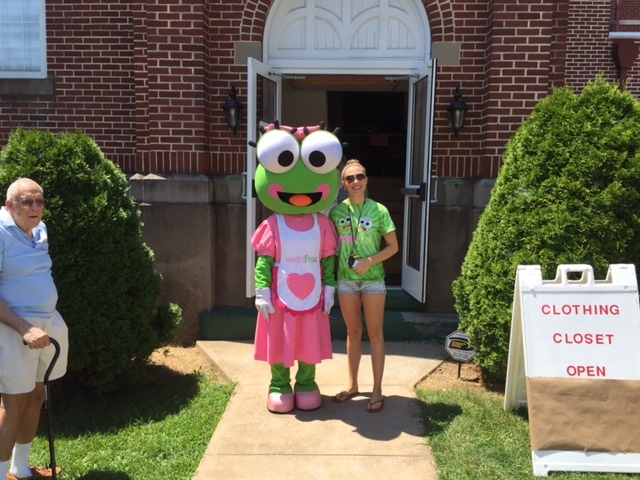 We also have pictures of performers at the Relay for Life Concert held Sunday afternoon. 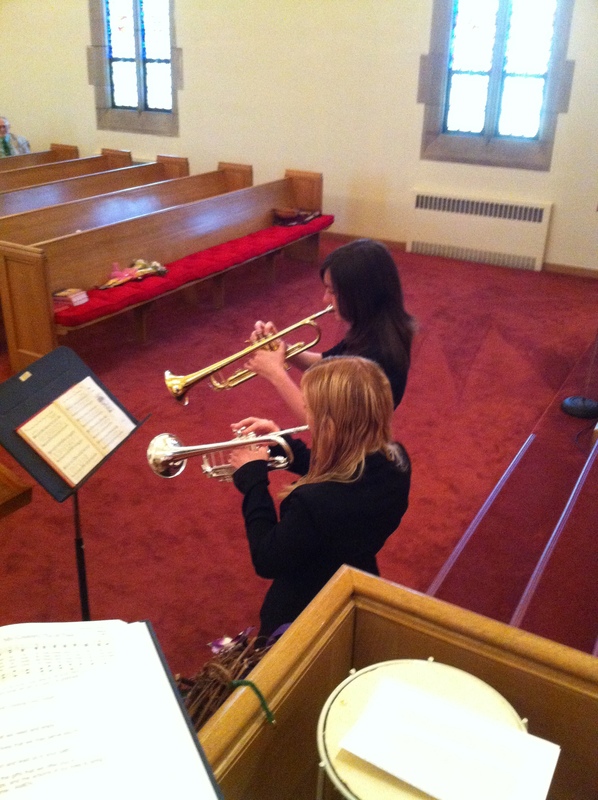 We feature Danielle Harbaugh (solo), Chelsea Writt (solo) and Buddy Trabert (solo). Sorry we don’t have a picture of the Waccy Chimers performers. Our photographer was busy substituting as one of the chimers. May 12 – Mothers Day! Part of the celebration included presenting roses to “special” mothers or grandmothers. 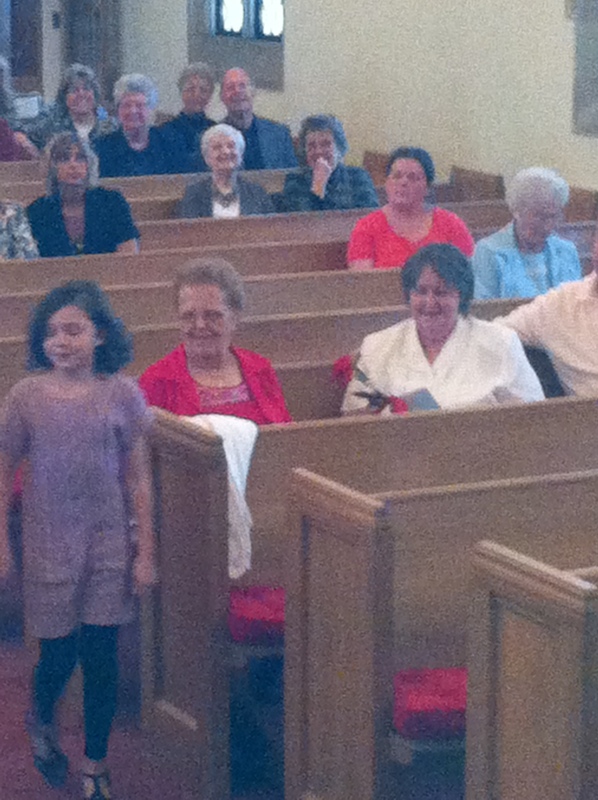 Dot Lucas received a rose for the “oldest mom.” Dot Simpson received a rose for having the most grandchildren. And Elsie Lichliter received a rose for the “fun” category of having the “largest handbag.’ See the pictures below. (Sorry about the quality….). 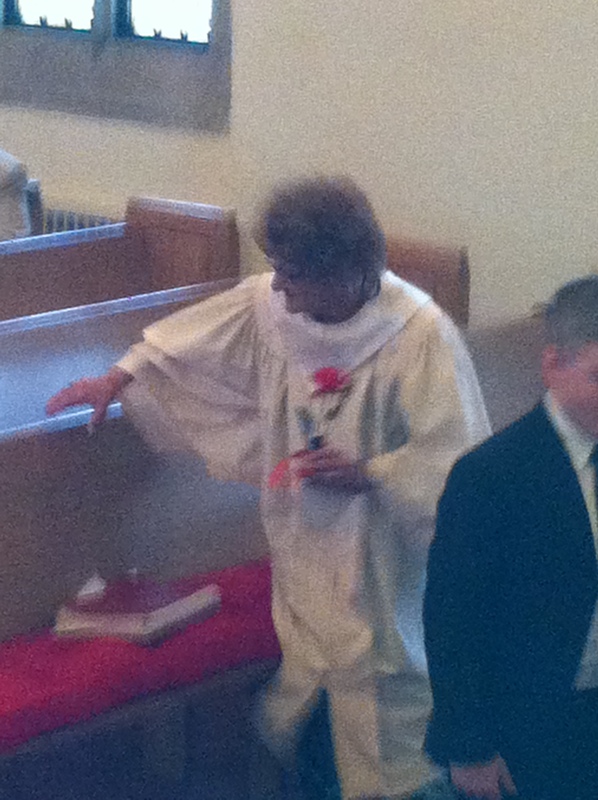 The “Young Disciples” helped hand out the roses. 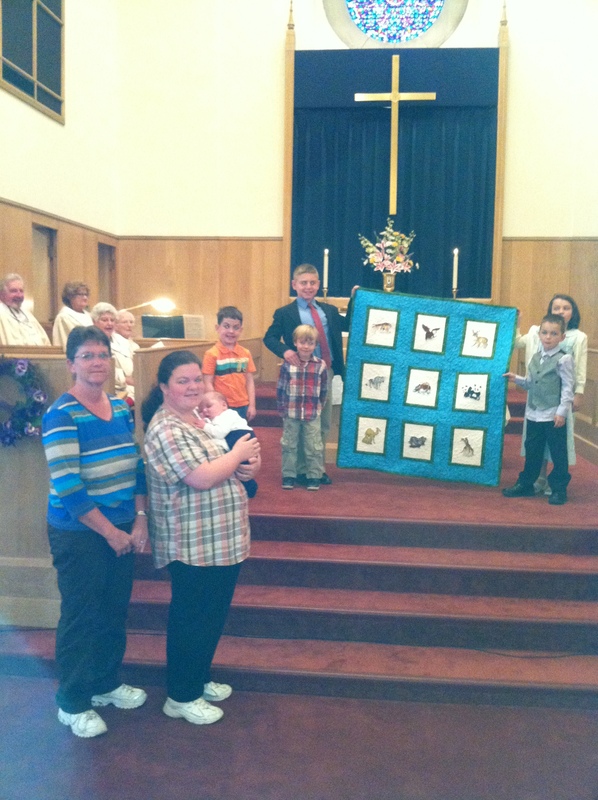 May 5 — A beautiful Baby Quilt was present to baby Karson Timothy Writt while brother Kaiden, Mother Chelsea and grandmother Cindy Graham look on. The Young Disciples participated in the presentation. 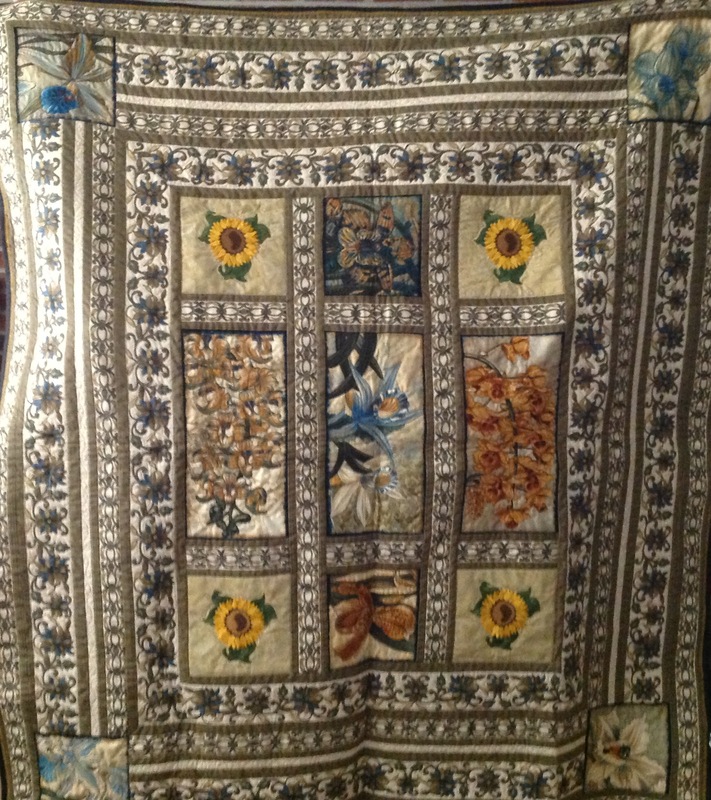 The quilt was made by Carolyn Manning. 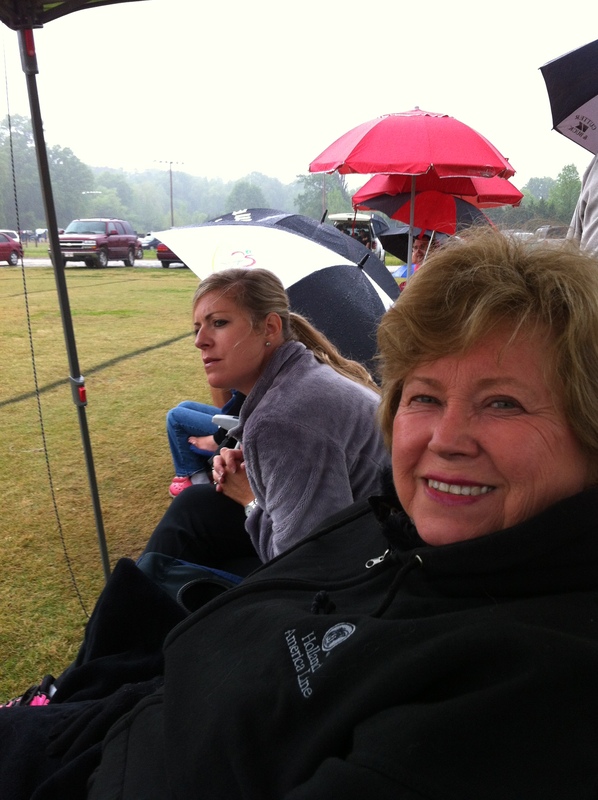 April 27 — Pastor Ben and Carolyn attend grandkids’ soccer tournament. 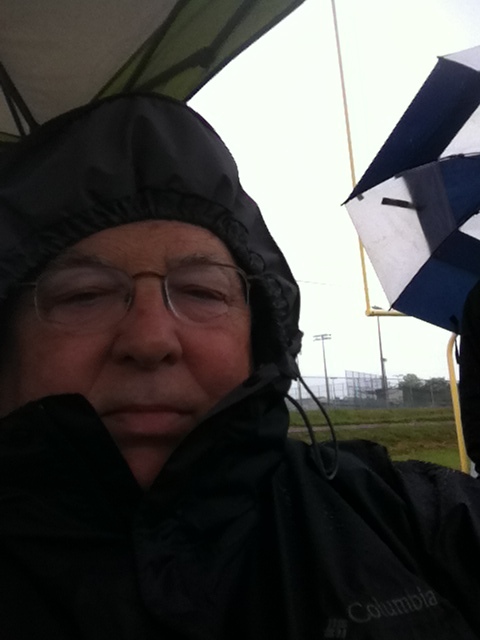 Six games in rainy North Carolina. They don’t stop the game for rain. Brrrr. Lots of Fun! 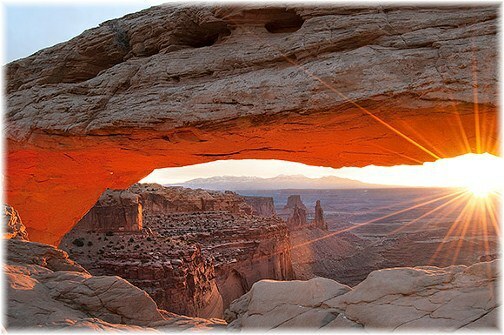 Many pleasing events–very good photography, too. So good to use more ways to share good news!